Waco — World Hunger Relief, Inc.
World Hunger Relief, Inc. established 1976. You can stop by the farm for eggs, meat and a WHRI t-shirt or two! Just check out our farm stand right inside the Education Building. We're located right off I-35 and New Dallas Highway, only a 10 minute drive from downtown Waco. If more than one person: "John & Jane"
Thank you! Be on the lookout for an email from us with next steps and payment details. Interactive tours tailored to your group's developmental levels and interests. We love to share our farm with visitors and our community. Farm tours make great field trips and outings for all age groups. Farm Tours cost $5 per person and are between 1 and 1.5 hours long. Identifying plants, stages of growth, and the needs of plants. Discussing vegetables and food production. Picking and tasting vegetables from the garden. Discussing and observing characteristics of goats, cows, rabbits, chickens, and worms. Feeling the fur of different animals. Discussing milk production from goats and observe a goat being milked when possible. Discussing and smelling various herbs. Discussing and observing characteristics, physiology, and function of farm animals. Exploring relatedness and interdependence of animals on the farm. Observing a goat being milked when possible. Identifying stages of plant and animal growth and needs of the earth in maintaining those systems. Comparing ecosystems and environmental conservation solutions such as composting. Discussing cycles of growth, geological formation, weather and climate. Explore issues of nutrition and health as they relate to food production and access. Discuss implications of agriculture, food, and relevant issues of social and economic justice. Discuss the difference between relief efforts and development work. WHRI has tours tailored to meet the Texas Essential Knowledge and Skills (TEKS) requirements for grades 1-6. We can customize farm visits to fit the curriculum, TEKS requirements, or learning objectives of any grade. Please consult the WHRI staff to plan your farm experience; this can include service projects, meaningful work experiences, and pre/post-visit interactions. To get a better idea of what our school tours involve please visit Education Resources and download the grade appropriate tour curriculum. 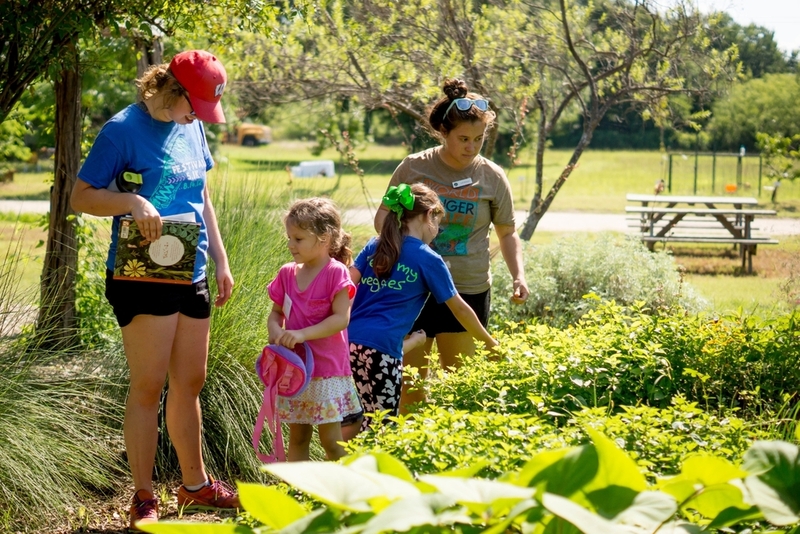 You will also be able to find links to additional educational resources that can help you and your students further explore gardens, food, compost, and much more! Lifestyles and their impact on the environment. Working models of principles taught in school science classes. Gardening, with an emphasis on organic and sustainable food production. Composting and conservation of resources. All our tours can be geared toward a particular topic of focus that interests your group and would make your visit to WHRI more valuable. Please don't hesitate to ask about any topic that interests you. Living On The Other Side: a global poverty service learning program for youth and adults, educating participants and inspiring active responses to issues of global hunger and poverty. An estimated 1.02 billion people in the world go hungry. Each year, 3 million under-five children die because they are undernourished. There is enough food in the world to feed everyone, so why are people hungry? This is an example of the type of probing question asked as a part of the Service Learning experience. Our enthusiastic staff is committed to educating participants about the causes and issues related to global hunger. These intersecting topics include poverty, issues affecting women and children, access to clean water, rural living, forced labor, global hunger awareness, and the impact of our lifestyle choices on our global neighbors. More than just sitting and listening, participants learn through games, videos, skits, and engaging educational activities. They will also participate in the daily labor faced by struggling families in order to better understand what life is like for the millions of hungry people around the world. The format of the Service Learning program is designed for either an 8-hour experience, or a more comprehensive 24-hour overnight experience. Both programs can be modified to fit your group’s area of interest within the goals and objectives of the program. We can tailor our LOTOS programming from being a 2 or 3 hour small group activity to a week long camp. Please contact localeducation@worldhungerrelief.org for more information about scheduling and pricing. Skip at least one meal prior to your arrival. Food will be available to you throughout the weekend, but having skipped a meal is an important part of our opening activities. Bring one change of clothing (that can get dirty), sleeping bag, and hygiene items in one small backpack. No cell phones or electronic devices, please! For more details, sample schedules, and registration forms please download our 2013 LOTOS Packet. Participants wrestle with the choices people in poverty are forced to make when buying food with limited resources. This activity visually and tangibly illustrates the distribution of population and resources around the world using our giant outdoor world map. Participants engage the issue of hunger through an interactive meal that represents the meals eaten worldwide and the gap between rich and poor. Participants prepare and eat an entire meal simulating developing world conditions: harvesting vegetables, carrying water, harvesting wood for a fire, and slaughtering a chicken if they choose to eat meat. To register or discuss, please contact localeducation@worldhungerrelief.org. Farm Staff, Daniel Stewart, and Dr. Jackson Griggs of the Family Health Center unload boxes at the main clinic. World Hunger Relief now partners with Family Health Center of Waco to provide one of the most basic medicines: healthy produce. Many of the diseases that inflict Americans the most like heart disease and diabetes are often linked with inadequate diets. One of the best things anyone can do for their health is to introduce more vegetables and fruits but this is often difficult for many people. Branching out to try new foods and new cooking methods is not easy, especially not on a busy schedule and limited budget. The Produce Prescription programs was designed to help doctors help their patients take a step in the right direction. At three Family Health Center clinics in Waco, doctors who decide their patients could benefit from the program are able to simply write a "prescription" for vegetables. The patients can then fill their prescription right there at the clinic! World Hunger Relief delivers boxes fresh boxes of produce twice a week. These boxes are filled with seasonal veggies and also include a card with a healthy, seasonal recipe written in both English and Spanish. We are so excited to be a part of this program! In the pilot program alone, we delivered thousands of boxes of produce to people who are excited about making positive lifestyle changes. 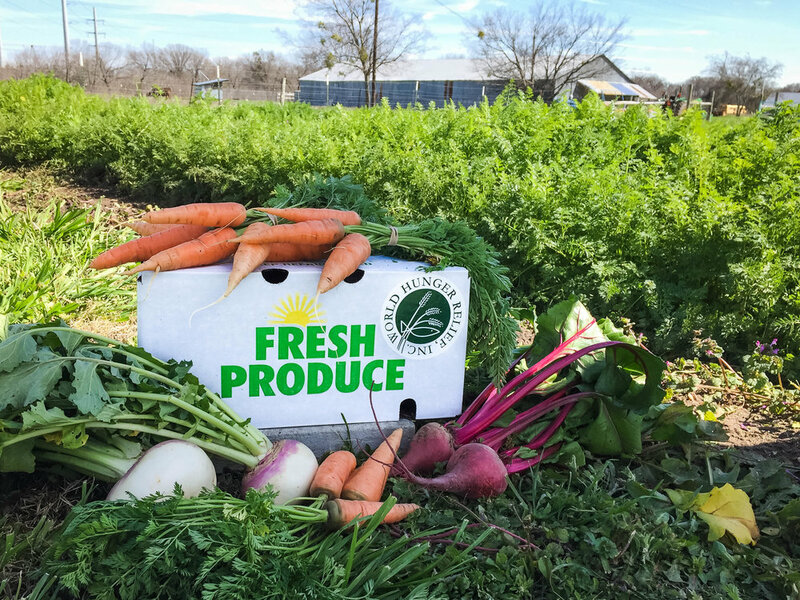 We know our produce is sustainably grown, local, and as fresh as you can get in Waco. We also know this program is working! Families who have participated in the Fresh Produce Prescription Program have even started coming to the Waco Downtown Farmers Market ready to get more vegetables and continue eating healthy. We love our city and love the opportunity to share our harvest with our neighbors! Providing so many vegetables has been quite a challenge! Production is way up in the garden and our interns and volunteers have worked incredibly hard to plant, weed, water, harvest, and package over 100 half bushel boxes every week in addition to everything we've grown for CSAs, Farmers Market, and ourselves! If you would like to be a part of this amazing program, consider giving time or money to help us keep growing! Read About Our Recipe Book! Are you looking for new ways to cook and prepare fresh and health produce? Are you intimidated by the thought of purchasing produce that is unfamiliar to you? Our new recipe book features over 70 recipes, preparation methods, and nutrition information for vegetables grown on the farm - everything from beets and broccoli, to collards and squash. With every book purchased, you are providing the same recipe book to patients of the Family Health Center as part of the Produce Prescription Program. This program allows doctors at the Family Health Center to write a “Produce Prescription” to patients who would benefit from greater access to a healthful diet of fruits and vegetables. These prescriptions are then “filled” with boxes of fresh, local produce provided by the World Hunger Relief Farm. By adding these recipe books to the program, we hope to empower patients to take full advantage of the health benefits offered through the produce given to them, make healthful decisions to include fruits and vegetables in their meals in the future, and decrease their risk for chronic disease.